Mangroves are unique coastal forest ecosystem distributed along the tropical and subtropical region of the world. They are evolutionarily adapted to combat against hostile environmental conditions such as low oxygen, high salinity, and temperature. The adaptive features endowed with novel secondary metabolic pathways and bioactive compounds to sustain in harsh conditions. The novel metabolites are a rich source of the wide range of bioactive compounds and natural products. It includes terpenoids, alkaloids, phenolics, saponins, flavonoids, and steroids. The bioactive and natural compounds may serve as therapeutic precursors and industrial raw materials. Terpenes and polyphenols have antiviral, antibacterial, antifungal, antimalarial, anticancer or combination of activities. 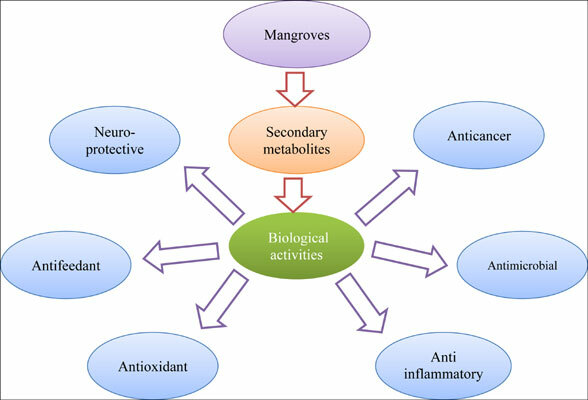 To date, several mangroves plants were examined and recognized as a potential source of novel natural product for exploitation in medicine. In fact, most of the isolated compounds are novel and showed promising biological activities such as gastroprotective, cytotoxic, antioxidant, antibacterial, antifungal, antiviral, enzyme activation and inhibition, immunosuppressive, anti-inflammatory, antifeedant effects. In the present review, we have compiled the achievements and progress in mangroves natural products research of the last decade. Keywords: Mangrove, bioactive, terpenoids, alkaloids, secondary metabolites, ecosystem. Keywords:Mangrove, bioactive, terpenoids, alkaloids, secondary metabolites, ecosystem. Abstract:Mangroves are unique coastal forest ecosystem distributed along the tropical and subtropical region of the world. They are evolutionarily adapted to combat against hostile environmental conditions such as low oxygen, high salinity, and temperature. The adaptive features endowed with novel secondary metabolic pathways and bioactive compounds to sustain in harsh conditions. The novel metabolites are a rich source of the wide range of bioactive compounds and natural products. It includes terpenoids, alkaloids, phenolics, saponins, flavonoids, and steroids. The bioactive and natural compounds may serve as therapeutic precursors and industrial raw materials. Terpenes and polyphenols have antiviral, antibacterial, antifungal, antimalarial, anticancer or combination of activities. To date, several mangroves plants were examined and recognized as a potential source of novel natural product for exploitation in medicine. In fact, most of the isolated compounds are novel and showed promising biological activities such as gastroprotective, cytotoxic, antioxidant, antibacterial, antifungal, antiviral, enzyme activation and inhibition, immunosuppressive, anti-inflammatory, antifeedant effects. In the present review, we have compiled the achievements and progress in mangroves natural products research of the last decade.